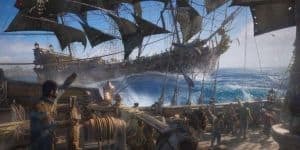 Ubisoft's Skull And Bones Will Have Single Player | Nerd Much? If pirate part of Assassin’s Creed: Black Flag was your favorite part, you’re in luck with Ubisoft’s new title, Skull and Bones. According to one of the reps at E3, interviewed by PC Gamer, The game will have both single and multiplayer. You can complete most of the game’s missions alone or with a group. However in the Raid the Hunting Grounds mission, the more people you have with you, the larger prey you can take down. But if you’re keen on sailing the seas alone, the Skull and Bones narrative driven campaign “will be integrated into the game and will not be something aside of the multiplayer experience.” You will not miss any content by choosing the single player, you will still “encounter iconic character and memorable rival pirates” that the game includes. The demo shown at E3, thought it’s focus was on the multiplayer mode, “is just the tip of the iceberg.” There will be plenty more to come and it won’t be just about firing as many canons as possible at other ships. There is certainly a great deal of potential in Skull and Bones, though I can’t help but notice the similarities with Rare’s Sea of Thieves. Skull and Bones seems to have very similar mechanics and world, just with a more realistic art style. I hope to see a larger distinction between the two soon. Skull and Bones is due to release in the fall of 2018.